With older stories and characters like Tarzan, Sherlock Holmes, Barsoom, and Buck Rogers increasingly protected by trademarks and not copyrights, it is becoming more and more important every day that anyone following digital publishing news understand the distinctions between these two parts of IP law, and how trademarks can be used to lock down works that have otherwise fallen into the public domain. This is a nuance that Boing Boing missed yesterday when it covered the recent copyright lawsuit over Buck Rogers. Earlier this year a filmmaker by the name of Don Murphy who had been hoping to make a movie based on the 87-year-old public domain story Armageddon 2419 AD filed a lawsuit against the Dille Family Trust, the legal entity that controls the IP of the author, Philip Francis Nowlan. Murphy asked a judge to declare that the story was in the public domain (you can read more about this over at Boing Boing). Since you can find the story over at Project Gutenberg (it's even appended to Murphy's filing), he's right. Murphy responded by filing suit in court, asking for a judgment that the Nowlan novel is in the public domain. Furthermore, he asked (as Klinger did with Holmes) for a declaration stating that since the character of Buck Rogers has his origins in the public domain novel, the character itself is therefore in the public domain and all trademarks for it should be voided. Yeah, that's not what the Murphy lawsuit says, and that's not what Klinger asked for when he sued the Conan Doyle estate over the Sherlock Holmes copyright. The problem here is that Boing Boing has conflated copyrights with trademarks, and assumed that because the former is no longer valid then neither is the latter. As I explained back in August, it is possible to hold a valid trademark on a work whose copyright has expired. For example, this is how the Burroughs estate maintains control over the Barsoom series. Do you recall that terrible John Carter of Mars movie from 2012? After it bombed at the box office, the rights reverted from Disney to the Burroughs estate (or so the estate claimed; I am unconvinced that the IP claims are valid). The trademark issue is important to this Buck Rogers lawsuit because while the copyrights may have expired, the trademarks might still be valid. A tv series based on Buck Rogers was produced in the 1970s, which means that there could be trademarks on elements from the stories. This movie that Murphy wants to make might contain elements that violate the estate's trademarks. We can't know that for sure without seeing the movie, but we also can't summarily discard the possibility. As I pointed out earlier this year, there's just too much we don't know. All I can say at this time is that when we hear of an author's estate acting as a copyright troll, we can't assume that only copyrights are involved. The trolls are now using trademarks to their advantage. For example, in June 2015 Miramax settled a lawsuit over Mr Holmes, a movie based on Mitch Cullin's book, A Slight Trick of The Mind. That lawsuit was brought by the Conan Doyle estate and alleged both copyright and trademark violations (this, even though the estate had never seen the movie in question nor sued over the book). And for that reason, any reports which describe this type of lawsuit as an obviously bogus lawsuit should be taken with a grain of salt. P.S. And to make things even more complicated, the copyright question is uncertain. Felix Torres has pointed out that "The original story has been adapted in newer novels that are still in copyright. There might be a valid claim on the basis of the newer stories." We won't know for sure until and unless this case goes through discovery and a judge issues a ruling. It is quite possible that at this point the only thing not under copyright (in one media or another) might be the title and the core idea. And only because those aren’t copyrightable. They might be able to do a movie about a time-lost soldier but they won’t be able to call him Anthony “Buck” Rogers or use any of the signature elements of the stort. At which point, why bother using the title and annoying the few who would recognize it? 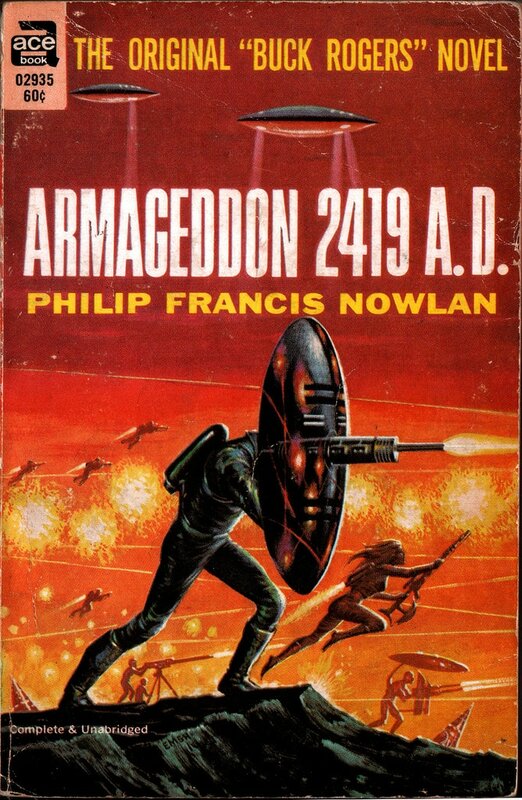 Neither Armageddon–2419 A.D. or The Airlords of Han used the name Buck Rogers in them. The public domain status of the stories have no affect on the trademarks or copyrights of later works that did use the name Buck Rogers. But what about other trademarks? Anything that’s in the two stories that are public domain are free game. If it came about in a later work (and the later work still has copyright) then it might still have a trademark. If I have time, I’ll hunt up the court case for this. It’s one of the standard cases that are studied. Here we go. Here is a nice write up on it. Trademark protection is independent of copyright. And it is common practice to trademark all the notable names in franchise properties so as long as somebody with the trademark or license to it is exploiting the property it remains covered, copyrighted or not. The original story can be distributed but derivative works will be limited to whatever elements are not covered by trademark or latter copyright. With Buck Rogers that is probably very little. We can’t know for sure without reading the actual trademark filing but odds are the at a minimum the names “Buck Rogers” and “Wilma Deering” are trademarked. And there is a good chance that “Anthony Rogers” is also off limits for space based SF stories in most media. That is the point I was trying to make with this post. You didn’t bother to read the Daystar Supreme court ruling. It’s not as cut and dried as you are making it out to be when it involves works that used to be covered by copyright and the copyright has expired. It’s not worth arguing with you about it though. It won’t be settled until the courts have finished ruling on this specific case anyway. You’re right, I hadn’t read it. I have now, and I can see that some of my assumptions were wrong. That article suggests that the copyright trolls that have tried to extend their control through trademarks will likely lose the case when someone takes them to court. Thanks for pointing us to the article; it answered questions that I was still asking. The issue, which Nate pointed out, is that this is not an issue of copyright alone but oneof trademark, which is awarded independently of copyright. There are plenty of things trademarked (and rightfully so) that havd no copyright protection. So it isn’t enough to say that the story is in the PD. In this case, “Buck Rogers” isn’t just a story element or a character; it is also a brand and a marketing term (like Mayday or Retina display or Siri) and thus worthy of trademarking and under trademark law protected from unlicensed use in “those specific areas”. Again, it will depend on the terms of the mark but odds are the trademark covers publishing, drama, and gaming but might not cover a rock band. Whether it can apply to deer hunting gear would be debatable. The core rule of trademark isn’t counterfeiting or passing but confusion. You don’t see FERD automobiles because the brand would be too close to Ford’s trademarked brand, but you *could* see Ford Baked Beans as long as they don’t use a blue oval. Nate, don’t be so sure that trademark can be so easily overturned. The first question is going to be the purpose of the trademark. Are they merely squatting or actively exploiting it? What is the extent of the exploitation and how tightly is it tied to the product? What would a reasonable person expect upon seeing it? But to be clear, I was never certain one way or the other on this issue. I had merely wished to make the point that there’s more to these copyright trolling cases than just copyright. Greg has helpfully provided a new wrinkle that shows that this is even more complicated than I previously thought. However you parse the legalese, corporations have so abused and manipulated patent, and copyright, and trademark laws that no IP will ever slip into the public domain ever again. I would not be surprised at all if everything ever written were retroactively stolen from us by copyright and/or patent trolls. But that’s not the way it should be. Copyright should only be for a *limited* time — *just* long enough for the original author to be rewarded for the work — after which it takes its place in the public domain as part of our shared culture. 20 years is more than long enough for this. And no public domain work or character should ever be granted a trademark, ever. But we live in a world where money is more important than what’s good for society. Just as an aside: control of BR now resides entirely with the Dille estate. The new series of BR novellas was authorized by them, not by Universal, despite them explicitly being about Universal’s version of Buck.